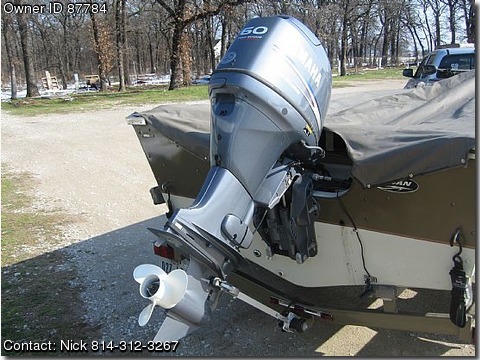 This boat and motor are LIKE NEW! Ultra low hours on the outboard. I've only fished with this boat a handful of times. The Yahama 60 HP Four Stroke is like new and is a great fit for the size of this boat. It starts up at the drop of a dime via electric key start. The top speed is approx 35 mph. Electronic hyodrolic Trim tabs on the throttle handle and also at the outboard. The boat handles exceptionally well in rough water. Custom cover fits great and keeps boat out of all the elements. I was suprised how well the boat fishes like a bass boat, yet is a semi-deep V.
The driver's chair is fully adjustable and the console is handy in choppy water. single axle trailer, folding tounge makes storing the boat an ease, spare tire mounted on trailer with chain and padlock, speedometer / rpm / gas guages, 2 batteries with charger, registered, 40# thrust foot control minnkota trolling motor, transom saver, nav lights, locking storage compartments (5), rod storage up to 7.5 feet, swivel seats, removeable windshield (side console), built in fuel tank (approx 17 gallons), dock rope, spare boat plug.